This water filter has more filtration material than others for better and longer filtration. These filters are available in 2-canister, 3-canister, and even when needed 4-canister configurations. (A 4-canister filter is 2 2-canister units in series. The final water filter canister is a wide-spectrum filter. It contains a full pound of pre-washed granulated carbon AND kdf AND 2 built-in sediment filters. The flow rate is excellent. Unlike some older technology types of filters, the water flows right through. We call this type of filtration “classic filtration”, as it mimics how Mother Earth cleans water as it flows through the ground. What you get is pure, healthy water with the trace-elements the body needs still in the water. The wide-spectrum cartridge (last in line) has kdf and pre-washed granulated coconut carbon for best filtration. Thees use the great combination of copper-zinc kdf and granulated coconut shell carbon, for the best-of-all-worlds filtering. Carbon lasts much longer in combination with kdf. The water is more natural. Bacteria cannot grow in the carbon because of the copper-zinc, which is bacteriostatic. This cartridge alone filters chlorine, chlorination byproducts, sediment, algae, molds, scale, bad taste, odors and hundreds of contaminants. The wide-spectrum cartridge can be used by itself in a one-canister system. Most people add one or two canisters for additional filtration. The second canister is most commonly used for a fluoride cartridge. There are two good options for filtering fluoride. One is activated alumina (which is of course not what we know of as the highly processed material we call aluminum.) The other is calcium-based carbon, also known as bone char. Each of these works very well and is completely safe. If you are vegetarian, you will probably favor activated alumina. Otherwise, it’s just a personal choice, as they are equally effective on municipally treated water. 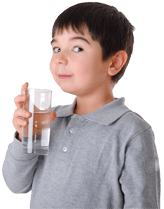 Additional cartridges are for filtering chloramine, arsenic, nitrates or other individual issues – most of which are not normally an issue with municipally-treated water. However, if people in your household have particular sensitivities, you may want the extra protection. People who add a third cartridge do so for a few reasons. One important is just that more filter material means more filtration – therefore more protection for the unexpected. Also, having 3 cartridges means greater flexibility going forward. If your water changes, or you move, you have what you need to put the cartridges in that are most needed. All cartridges are interchangeable, as they all are the same size and fit the canisters. All units are available in countertop or under-the-sink (undercounter) models. For help selecting the best filter for your situation, email us at [email protected] with the town and state where you live. Countertop filters simply connect via a diverter at the end of your kitchen faucet. Undercounter filters need to be installed by someone who knows plumbing. If you don’t know if you can do it or not, and are asking us if you can do it – then the answer is no. Get a plumber.